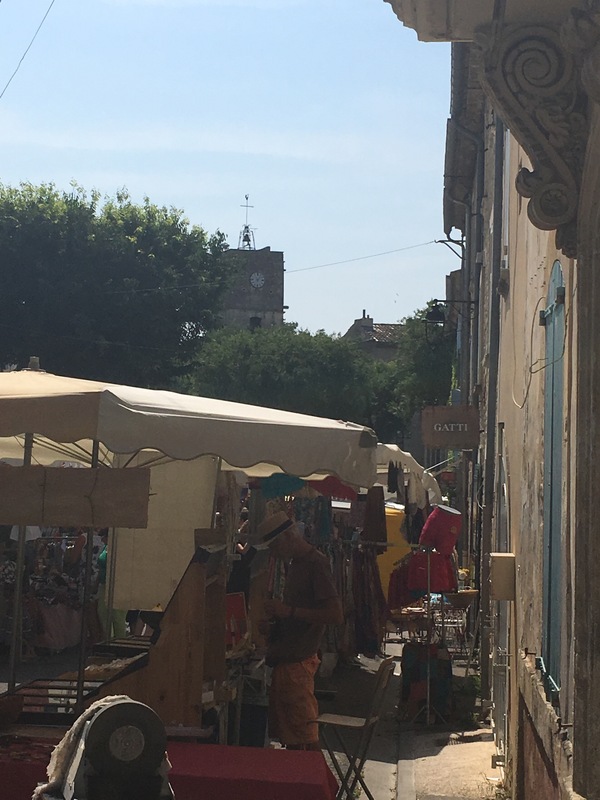 I like Thursdays for many reasons – not only is it nearly the weekend, or a chance for yoga both in the U.K. and here in France, but there’s also a good handful of markets to choose from. 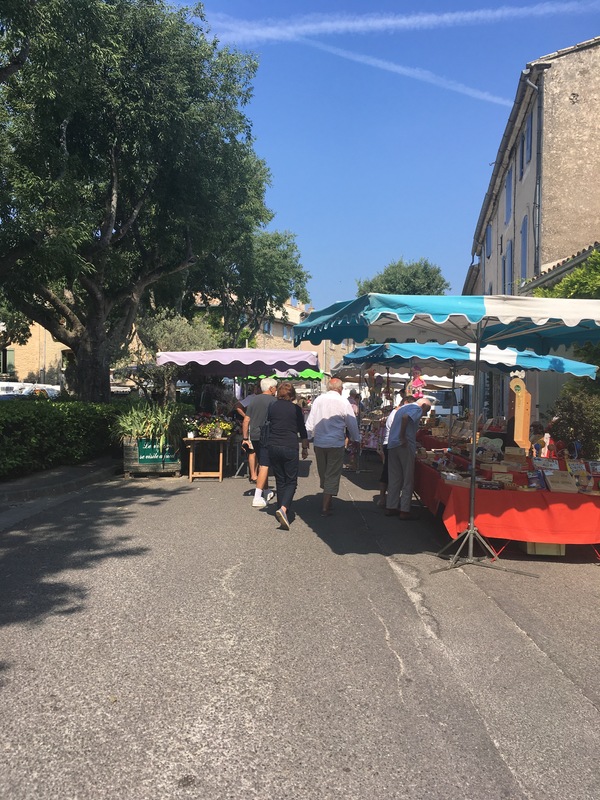 There’s the lovely mid-week one at L’Isle Sur La Sorgue, slightly smaller than the Sunday event, but delightful all the same – or we can head the other way to the hilltop town of Reillanne – a few kilometres the other side of Cereste, equally as tempting. 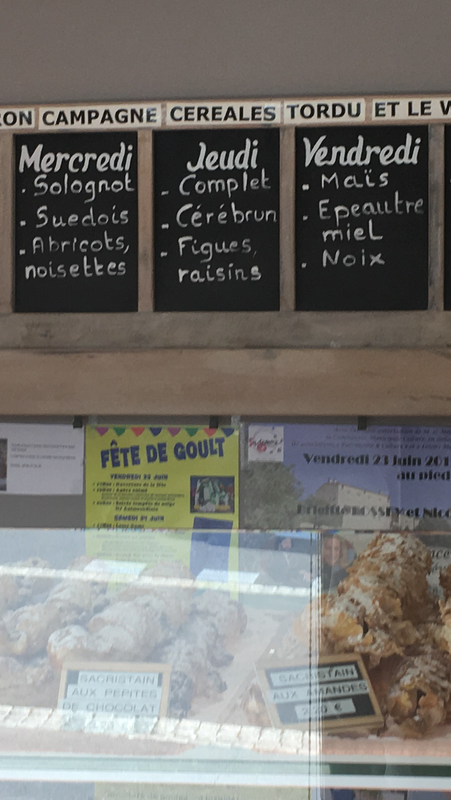 Yesterday though the markets of Goult and Roussillon worked their way to the top of the list – Goult simply because it’s the day the local Boulangerie bakes its Fig & Raisin bread (worth the trip every time)…..
Goult Boulangerie lists its special breads for each day of the week. Wednesday’s sounds good too! And Roussillon as it’s really beautiful & only a short cycle on from Goult, and so helps to make a nice circular ride. 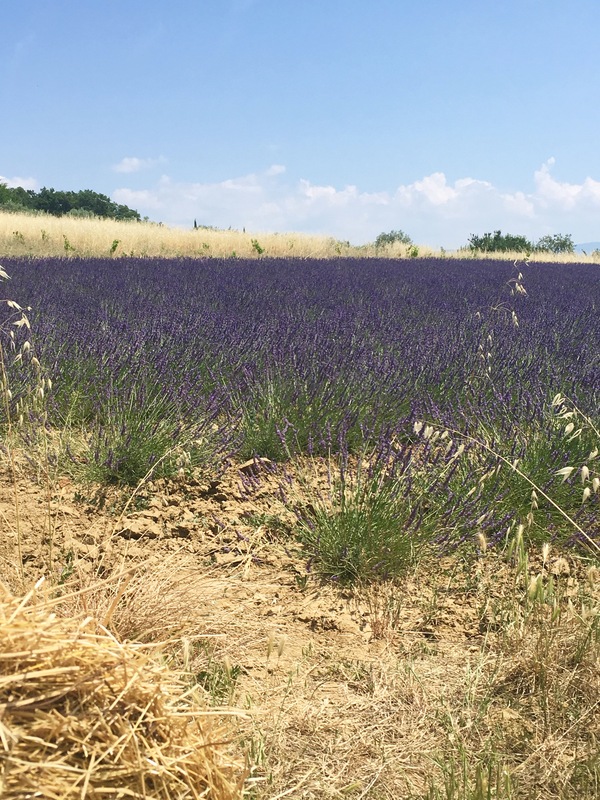 As ever the ride starts on the Veloroute du Calavon, which was nice and quiet, surprising as it was perfect cycling weather first thing and there are some great views of the lavender fields on the valley floor towards Lacoste. 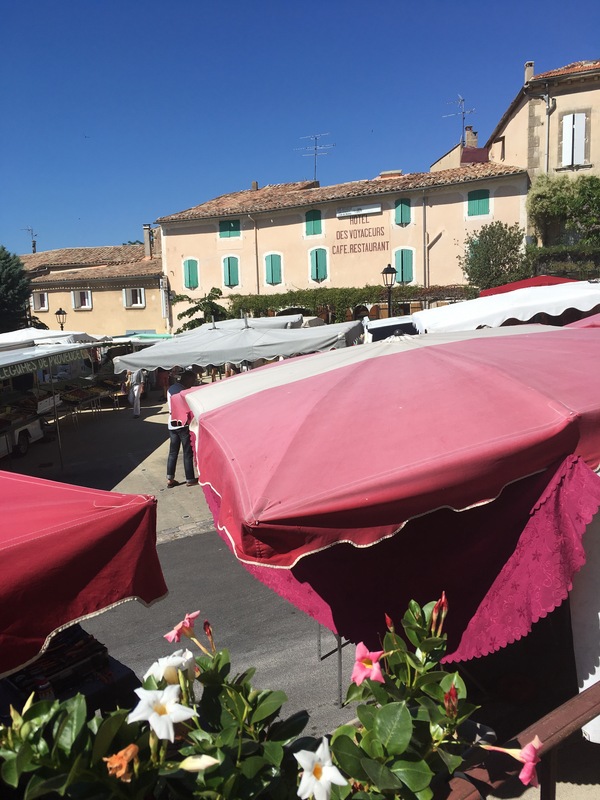 I started by heading out through Apt and on past Le Pont Julien and the Cave de Bonnieux to the point where the Veloroute crosses the small road that runs between Lacoste and Lumières, turning right here and heading across the main road into Lumières. From here you turn right halfway through the village, then right again that takes you on a gently climbing hill into the village of Goult. I remember the first time we cycled up here (about 28 years ago) I thought I was going to expire by the time we reached the top – today I’m happy to say I find it rather less-taxing! Goult is incredibly pretty, perched high above the valley floor, with beautiful views in almost all directions. 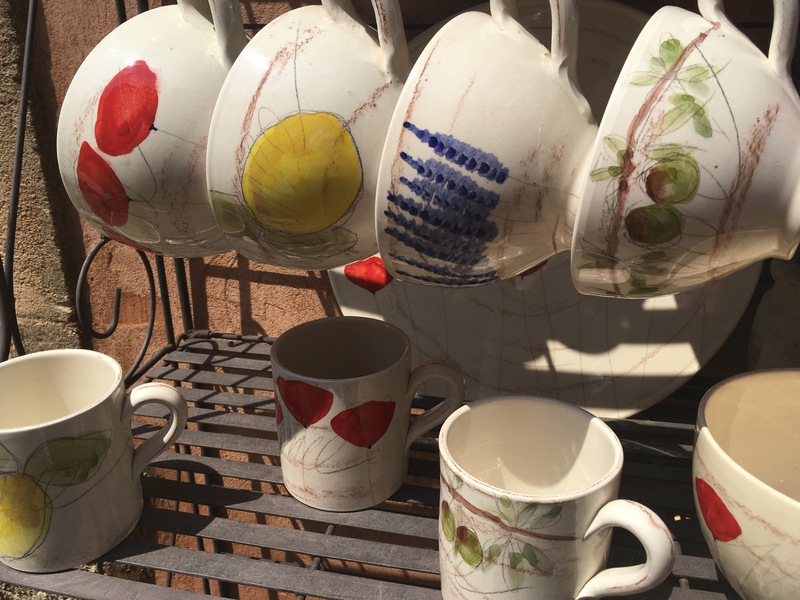 With Thursday being Market day the whole village comes to life. The main road is shut from the square outside the church and the colourful umbrellas of the market stalls take over the streets. It’s not a big market, in fact it is much smaller than many others, but that doesn’t make it any less enjoyable. 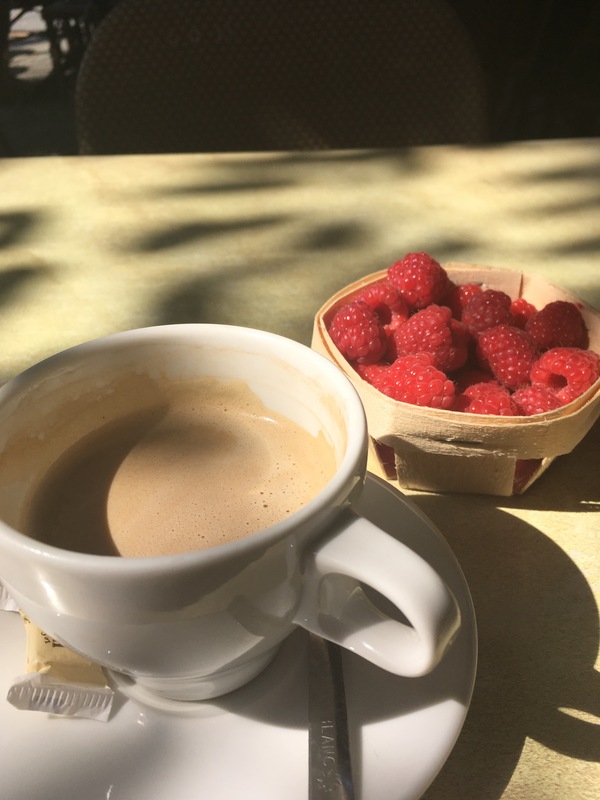 So, after buying my much-loved Fig & Raisin bread, I bought a punnet of fresh raspberries and sat at the Café de La Poste munching on them, whilst enjoying a grand crème and watching the world pass by – a perfect mid-morning break. There is always such a delightful babble of noise at the markets and Goult is no exception to this. Anyway, however nice it would have been to just call it a day in Goult I wanted we to get on to Roussillon, so hopped back on Miss Daisy (with a slightly fuller basket now) and cycled out of the back of the village and onto the road that climbs onto a ridge of land towards Roussillon. 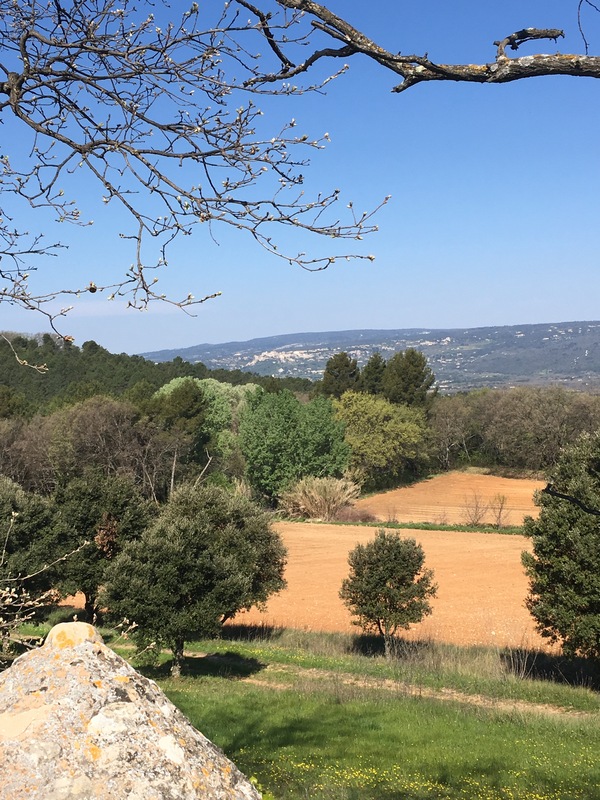 This is a bit of a long climb, but the views from the top across towards Gordes, The Vaucluse Plateau and the ever present Mont Ventoux are worth it, as are the top antialiasing glimpses of the ochres of Roussillon through the trees. You couldn’t really call it a quiet ride today as going through the pine trees along the top of the ridge the Cicadas were in full ‘voice’ to the point that you could hardly hear yourself think! So much for peaceful Provence! – don’t get me wrong -though – I love it! 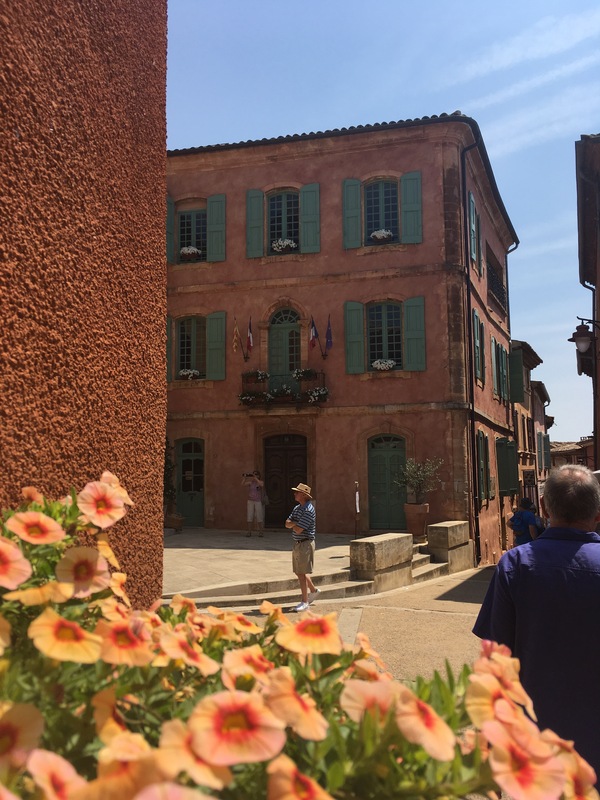 Arriving in Roussillon is always a pleasure – I never tire of the colours and despite the fact that the village has exploded with tourists (some today snaking after a lady carrying a large fan above her head) – I still find it a wonderful place to sit for a while. 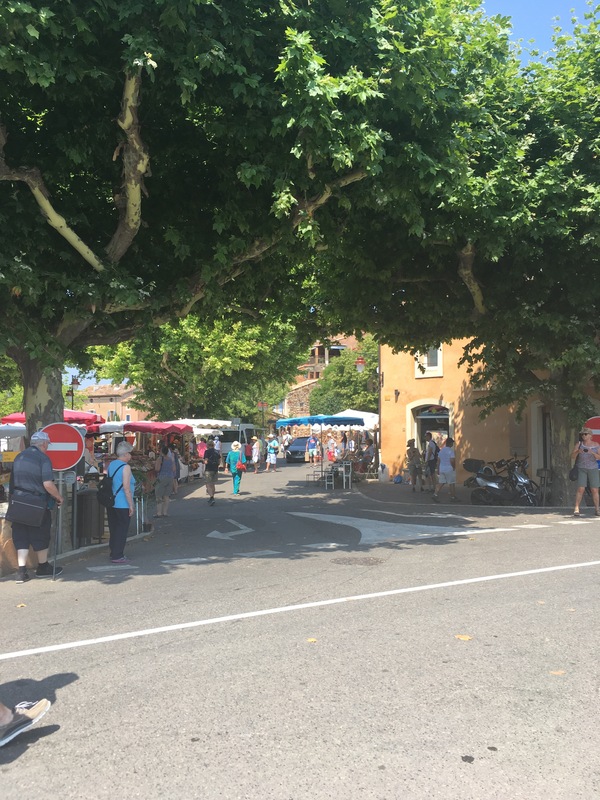 Whilst there are plenty of nice places for a hot, weary cyclist to rest and have something to eat – I opted for a market lunch. 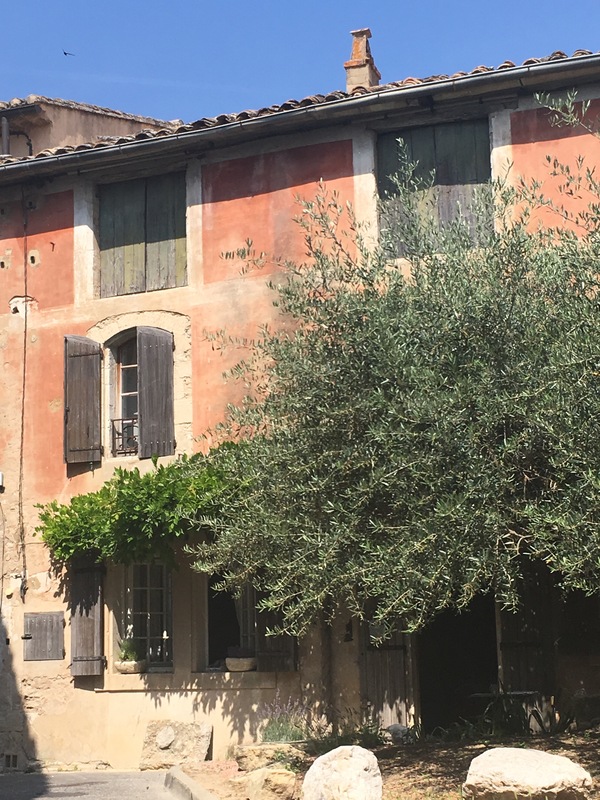 Why sit in a restaurant when you can buy some lovely bread from the ever-friendly boulangerie at the entrance to the village and eat that with some sun-warmed tomatoes, cherries and apricots, whilst sitting on a wall watching the world go about its business. 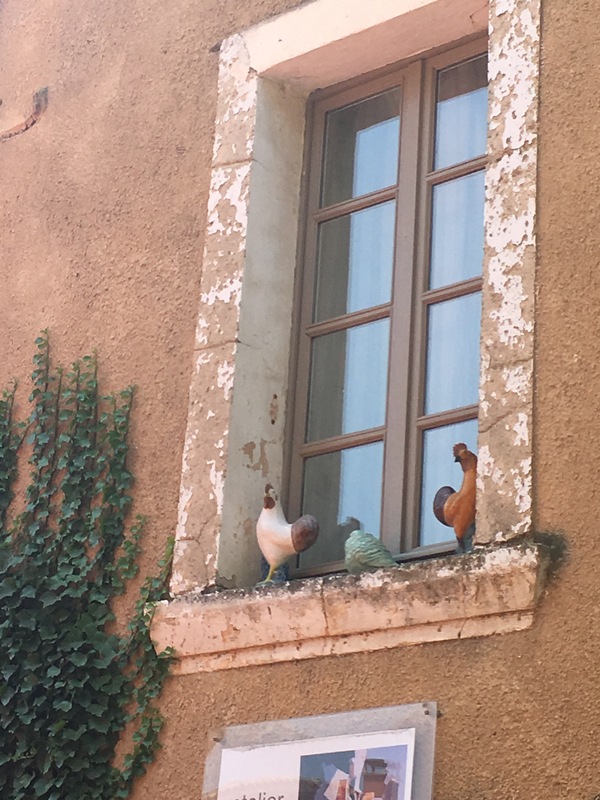 It also means you see little touches you may otherwise miss like these pottery hens pecking on a windowsill. It’s important to look up! 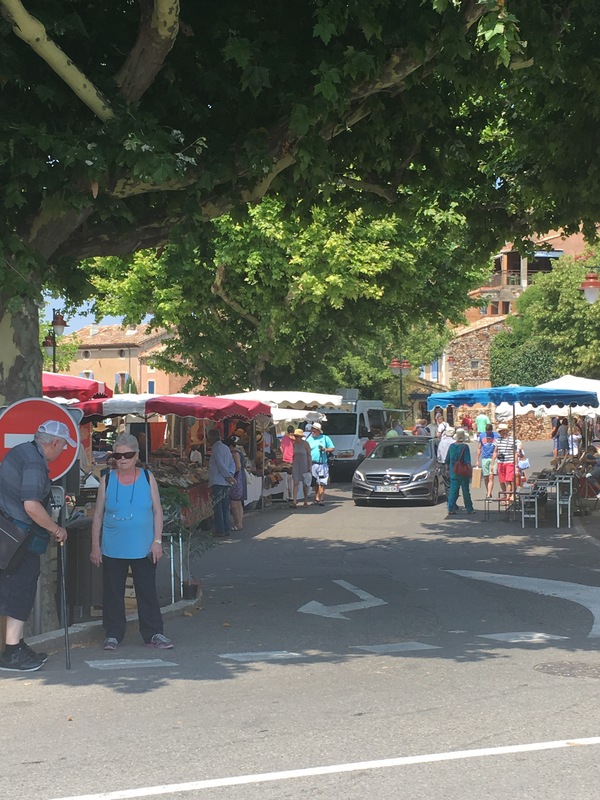 Roussillon market is slightly larger than that at Goult and is based in the car ark outside the village hall, straddling the road that runs below the village. It is always bright and has a nice mix of produce and crafts so I am inevitably happy to find an excuse to visit. Rather than dropping out of the back of the village towards Saint Saturnin, which is a nice route back, I followed the road out towards the Conservatoire Des Ochres and I was so pleased I did. It’s always a nice swishy downhill, but today I was taken aback by the lavender fields in full bloom in the way down. The lavender was stunning last year, but this year it seems to be an even more vivid purple and the sound of the bees working their way through the flowers is almost loud enough to drown out the Cicadas. At the bottom of this road I turned right, heading past the AptUnion ‘Confit Fruit’ producer, which today smelt wonderfully sweet, continuing down to Le Chêne, where you pick up the Veloroute again towards Apt. The circular ride for me is a little under 50km, so not a huge excursion, but a gentle ride to 2 lively local markets. And believe me the Fig & Raisin bread is worth every turn of the pedal! 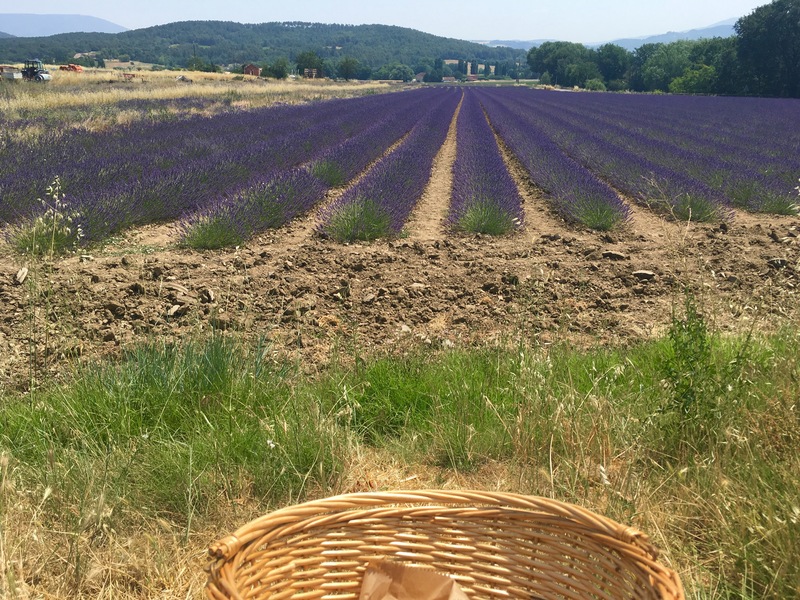 I took that same picture of the lavender in the valley below Lacoste just yesterday! My husband and I are staying in a rental just a few minutes from that field! It is so beautiful here right now, and we are enjoying riding our bikes around too. Happy riding! It’s just stunning at the moment isn’t it – hope you have a great stay here – perhaps we’ll pass each other on bikes at some point!